Puppy Puppy Puppy!!! 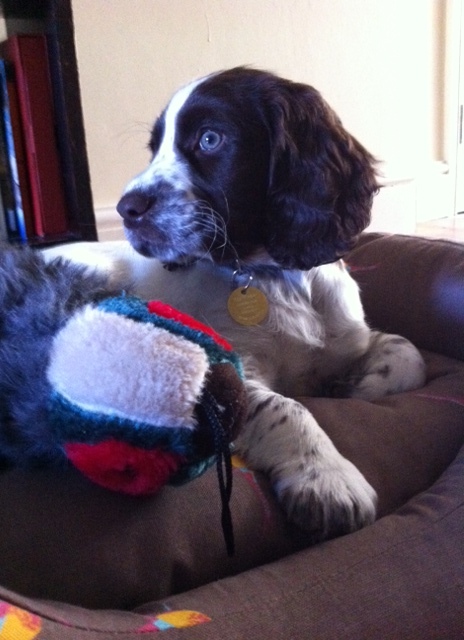 After 8 weeks of waiting, we finally brought our scrumptious spaniel home last week, dear Reader! Jerry, Poppy, Primrose and I stood on the doorstep for our first family photograph and it felt like we were bringing home another newborn baby! So far Monty is proving to be every bit as gorgeous in temperament as he is in looks and doesn’t even mind when well meaning visitors ask if he is a Springer! His first night went so well that Jerry and I were slightly worried that he wasn’t breathing. I suddenly wished that we had bought a CCTV-style baby monitor so that I could check on him without having to go downstairs and wake the whole household. The last pup to leave his mother, he had already spent one night on his own and after a long day’s play with our girls, he was so exhausted that took himself off to his bed inside his crate. We didn’t hear a peep from him until we all got up at 6am the next morning (Jerry and I never get a lie in as Primrose and Poppy are the early to bed, early to rise sort of children……sadly). There have been the piddles and puddles as we expected but he is pretty good at calling us to open the back door to be let out now. He has also proved the perfect tonic for dearest Poppy who has been very ill, having caught the dreaded chickenpox, with infected spots and temperatures of seriously high proportions. Not an inch of skin could be seen on her and she was unable to do much more than flop on the sofa and whimper just like a little pup. In response to her obvious distress, Monty has licked her, let her snuggle down with him and even rest her head on his back – thus proving that a well known fact that dogs are extremely good therapy. A trip to the vet and first jabs over and done with, we are now looking forward to the second jab when we can FINALLY take Monty out for a walk. In the meantime, I have resorted to taking him out for a wander inside my coat so that he can begin to get used to all the sights and sounds of the Big Smoke as I push Poppy in her buggy. 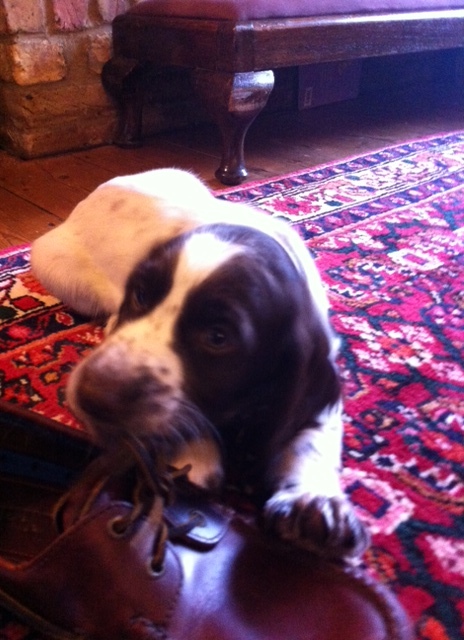 I am not entirely sure why I received such strange looks……surely everyone carries a dog in their Barbour, dear Reader?! Alongside the Brilliance in Blogging awards shortlisting (which is fantastic and many many thanks to those of you who voted for me), I have some other exciting news to share this week, dear Reader. This month will see the launch of Monty’s own blogging adventures and he and I will be sharing our puppy ups and downs as a monthly featured blog on the National Farmers Union’s Countryside website and magazine here so do look out for us! The first installment will be published next week and Monty and I are looking forward to seeing our names in print – huge thanks to NFU Countryside for making it happen! PS…..Being on the Britmums Brilliance in Blogging awards shortlist is truly marvellous and I cannot thank those of you who nominated me enough. There are TONS of fantastic blogs on the list. They all deserve a vote in my opinion and I am honoured to considered among them. Do vote for your favourites at Britmums – I know I speak for all the bloggers when I say it means such a lot to us that you read and follow our capers! 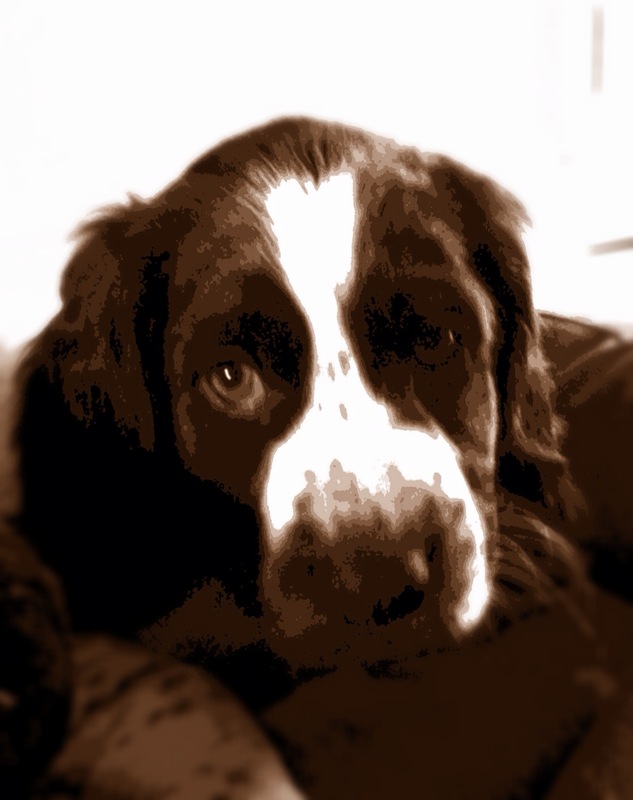 This entry was posted in Monty's Tail and tagged #BiBs, blog, bloggers, Brilliance in Blogging, Britmums, dog, Monty, Nataional Farmers Union, NFU, NFU Countryside, nominations, pheasant, puppy, shortlist, walks on April 27, 2013 by admin.